WAIST HIGH: Happy 25th Birthday Billy Idol. Happy 25th Birthday Billy Idol. 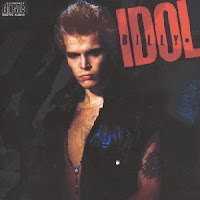 Released by Chrysalis Records in 1982, Billy Idol was the solo debut by Billy Idol. Preceded by the single "Hot in the City," the album peaked at number 45 on the Billboard 200. The second single from the album, "White Wedding," entered the Top 40, reaching #36. The album was reissued in 1983 with the addition of a cover of Generation X's "Dancing With Myself."